Hill stations near Bangalore often come enveloped in jungles, plantations, and sparkling waterfalls, where you spend your day in a hammock or working up a sweat trekking. Here’s where you can head to for a weekend of peace and quiet this upcoming long-weekend season. And the good news? These destinations are just a drive away. Gracing the south-eastern border of Karnataka, the BR Hills link the Eastern and Western Ghats. Its unique ecosystem is rich in wildlife and on safaris you’ll see herds of elephants, gaurs, deer, and if you’re lucky, tigers and leopards too. You can park yourself at cosy lodges in the midst of the jungle or stay at homely farmhouses. Part of the Nilgiri Hills, Coonoor looks a lot like Ooty except it’s much less crowded. The scenic views and the endless tea plantations are the town’s main attractions. Picturesque, heritage hotels and homestays are common here. Learn how to make cheese here at Acres Wild, a farm stay owned by Mansoor Ali Khan (Former Bollywood director and cousin to actor Aamir Khan) and his wife Tina. There’s plenty to do in Coorg, that’s for sure. You can trek through the hills and coffee plantations, embark on wildlife safaris, visit local Tibetan settlements, and tuck into delicious Pandi curry – it’s all there! For a taste of the famous Kodava hospitality, you can check into any of the homestays or you can cool your heels at a lavish, star properties as well. In the recent years, Chikmagalur has surely climbed up the popularity charts for holiday destinations. Nestled in the foothills of the Mullayanagiri range, the place is covered with coffee plantations. Tour operators also offer camping and trekking tours if you’d like to do more than just bumming around. Luxury resorts have mushroomed as of late but if you are looking for a more pocket-friendly option then you can check into a homestay. North of Bangalore, Andhra Pradesh’s Chittoor district is home to the splendid Horsley Hills. The unspoiled hills covered in thick forests are a sight to behold and make for a serene spot where you catch a breath of fresh air. Do drop by the Koudinya Wildlife Sanctuary for sightings of wild dogs, bears, sambar deer, and panthers. When planning your stay, you can choose from Government-run cottages and resorts. 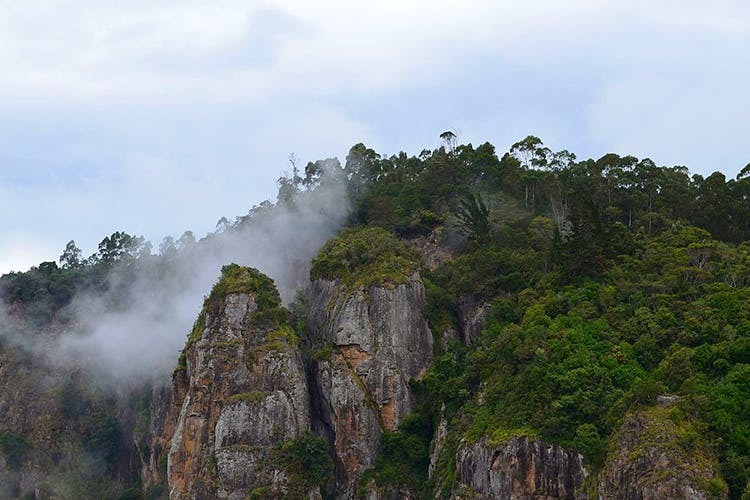 A honeymooner’s paradise, Kodaikanal’s green hills come shrouded in swirls of mists. The Kodaikanal Lake, right at the centre, is a serene oasis from where you can gaze at the looming Palani Hills. There are plenty of viewpoints and rock formations around town that offer mesmerising sceneries, and homestays for a more natural view of the greenery around you. You can check into upmarket digs or budget stays here. A tiny hill station, Kudremukh (means horse face thanks to a local hill that’s shaped so) was once a mining hotspot. The hilly retreat is cloaked in greenery with rivers criss-crossing. The gushing Kadambi Waterfalls are a spectacular sight and the National Park is where you watch out for the rare lion-tailed macaque. If you are not part of a trekking and camping tour, you can book a homestay. One of the latest additions to travel guides, Kolli Hills are marked by 70 hairpin bends that will test your driving skills. When you’ve passed, you’ll be treated to untouched cascades, pathways lined with silver oaks, and stunning views of the surrounding hills. Since it’s still unexplored, there are only a handful of resorts and mid-range hotels that you can stay at. Surrounded by tea plantations, that are only interrupted by waterfalls, Munnar exudes romance which is why many honeymooning couples stop by. For sightseeing, you can visit the endangered Nilgiri Tahr at the Eravikulam National Park and tour the Tea Museum. Out in the hills, you’ll be able to sign up for secluded hotels and homestays while basic hotels are common in town. Bright, green paddy fields and tall hills stretch out on either side of the roads as you drive through Wayanad. Your itinerary can include a trek through Chembra Peak, a safari ride through the Wayanad Sanctuary, and visit the ancient caves at Edakkal. You’ll find plenty of resorts that are perfect for families and couples. Just outside Chennai, the winding hills of Yellagiri make for a great weekend getaway. You can spend hours ambling through the many orchards and gardens that dot the hill and also take a leisurely boat-ride in the Punganur Lake. Budget hotels are the norm here. Sitting pretty amidst the Shevaroy hills, Yercaud has been tourist favourite for a while now. Paddle around the Big Lake, at the heart of the hill station, for panoramic views. Strolling in parks, fruit orchards, coffee plantations, and by waterfalls will help you leave behind the mundanity of city life. Lavish hotels, hill resorts, and budget stays are all available here. Not quite your hill station but just a hill, don’t disregard Nandidurg (it’s original) name for a quick getaway. Apart from refreshing crisp air, lovely views of the swiftly expanding Bangalore or a sunrise to mesmerise you, there’s a 1,200-year-old Dravidian Nandi temple – a monolithic monument worth seeing, plus Tipu’s Drop (where the ruler had prisoners kicked off) and government bungalows, that are stuck in time and are great for a night-spend.